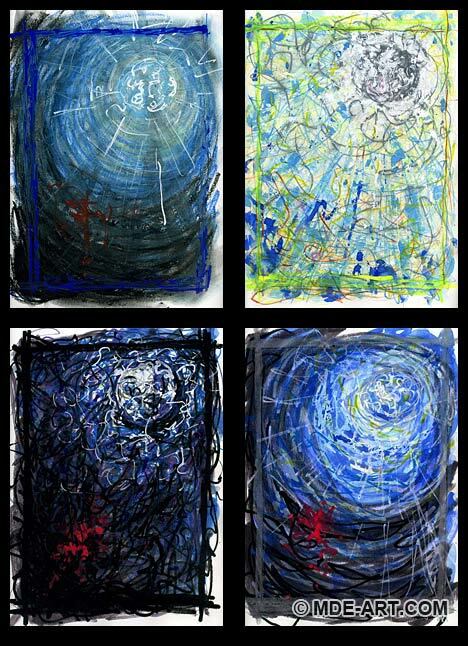 The following artworks are part of a series of drawings/paintings of windows to the moon, each drawn and painted in an abstract style with different mediums. Each single window is approximately 12″x9″, containing a mix of media, including watercolors, pens, markers, colored pencils, paint pens, and oil pastels. 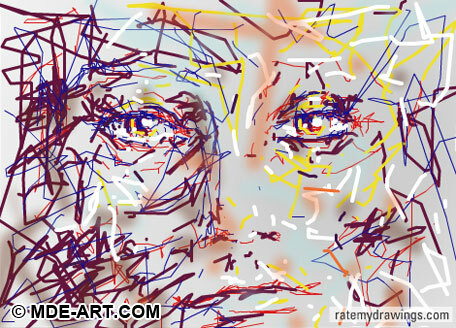 The drawings are gestural and impressionistic, evoking a unique atmosphere when seen together or separately. The moon shines bright through each window amidst the dark night colored with black, red, and blue. Occasionally, the moon is visible during the daylight colored with blue, yellow, and white. 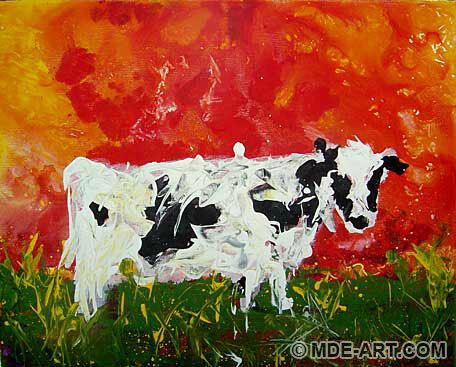 This is a painting of a cow amidst a green field and a fiery red background. 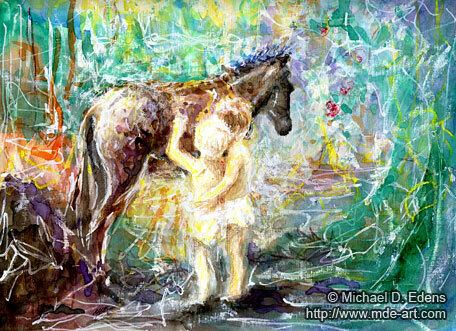 The canvas is approximately 16″x20″ and the entire artwork was painted with Acrylic paints. 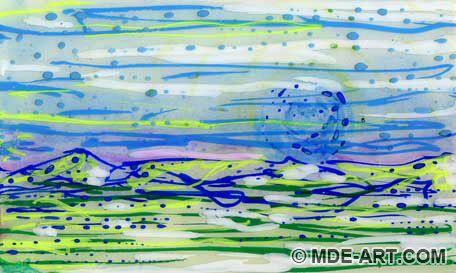 The billowing and vibrant background contrasts interestingly with the energetic cow and grassy field in the foreground. Splashes of yellow paint add the impression of flowers and help pull the yellow areas of the background into the foreground. This particular breed of cow is known as a Holstein cow, which is commonly raised for dairy production. Mooooo! 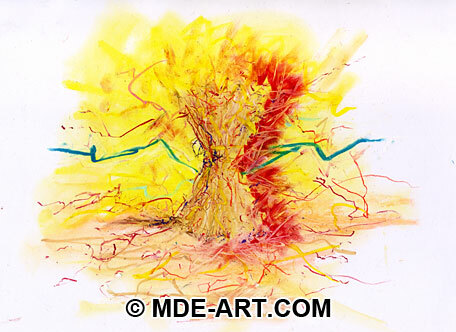 The following three landscape paintings are approximately 3″x5″ and were painted with watercolors, markers, and paint pens on paper and multiple layers of laminate. 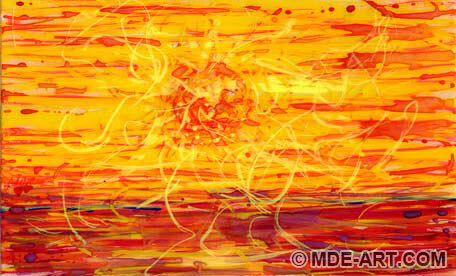 The first painting is a yellow and white sun shining over a red landscape. 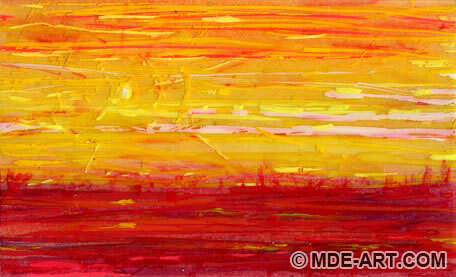 The second painting is a scorching red-orange sun heating a red and purple landscape. And the third painting is a blue moon hovering over blue mountains and a green landscape. 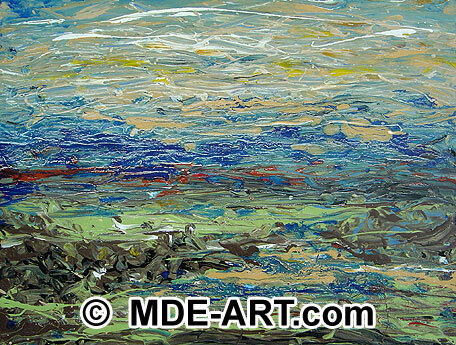 Each landscape painting consists of at least 3 layers of laminate which separate the washes and crisp lines of color, and add subtle variations in depth. 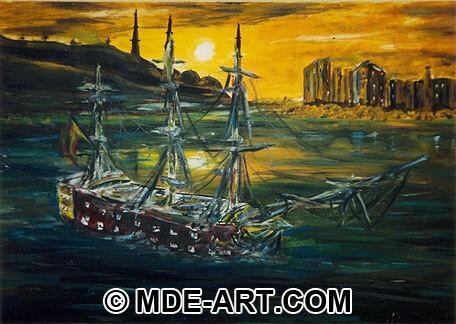 Visit the Art Gallery for more Landscape Paintings. 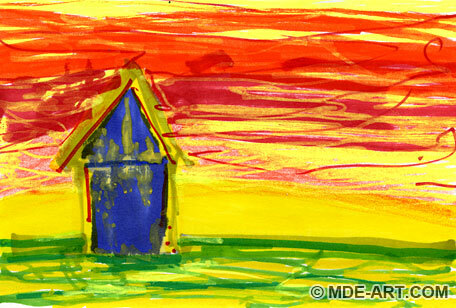 “Out of the Blue” is a 4″x6″ abstract sketch of a house and sunset, drawn with marker, crayon, paint pen, and colored pencil. My attention was focused on the colors more than anything else. I wanted to see what effect a few disjointed gradients and juxtapositions of specific colors would have on each other and the overall artwork. 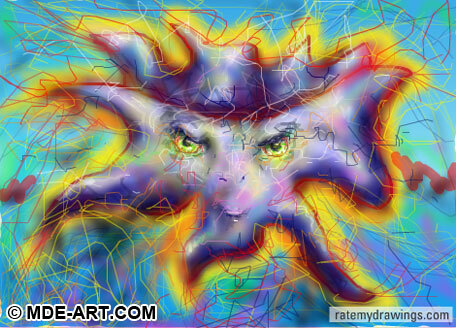 Bright and sunny, with bold red, green, blue, and yellow. 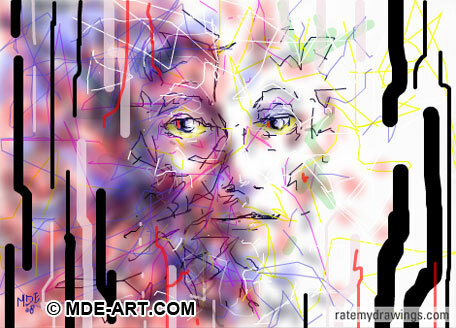 Similar frantic style, but a new direction. Metaphorically speaking, sometimes it’s helpful to draw or paint with one arm tied behind my back. “Adriaaaan!” 😉 Slowing down with thoughtful color choices increased my awareness, and it’s refreshing to mix things up in a creative rut. 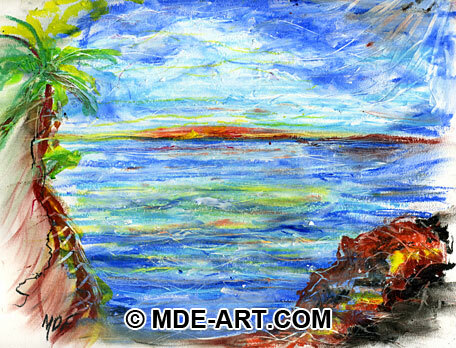 This is an oil pastel drawing of an ocean seascape at sunrise. 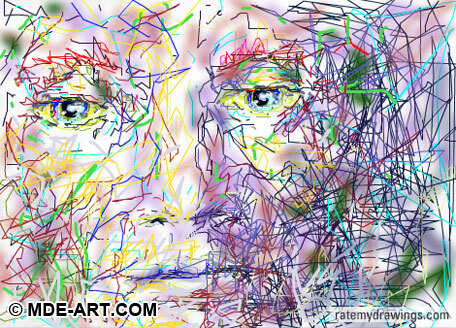 The oil pastel medium lends itself to smudging and smearing techniques, as well as scraping away layers to reveal colors underneath. The drawing also reflects an impressionistic style with a little bit of chaotic line work, noticeable in the clouds and water. The suggestion of dirt, rocks, sand, and a palm tree begin to frame and weight the artwork as well. 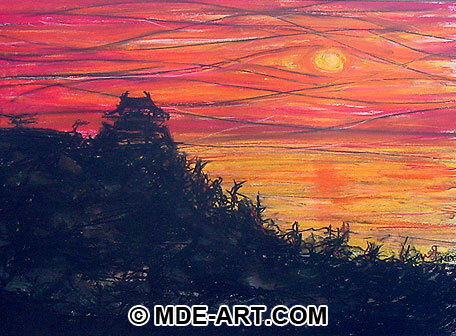 This charcoal drawing of Asian architecture silhouetted by a sunset was drawn in 1998. 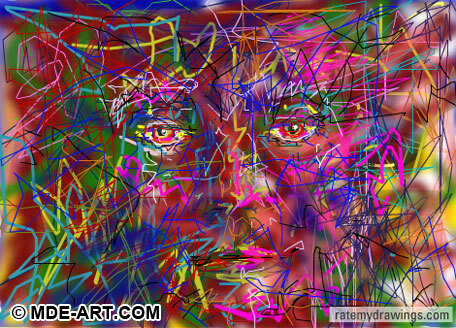 Deep reds, oranges, and yellows were blended across the background. The chalky pastels were rubbed back and forth and then dark blue and black lines were added to create a unique style in the sky. Quick and energetic lines and squiggles were drawn with black charcoal to create the hilltop and Asian architecture in the foreground. The charcoal was then smudged and drawn again to further reinforce the depth of the shadows. While the intense red colors and black lines in the sky add a certain tension to the artwork, the overall composition of the black and red shapes of the foreground and background encourage a harmonious balance with reversed symmetry. 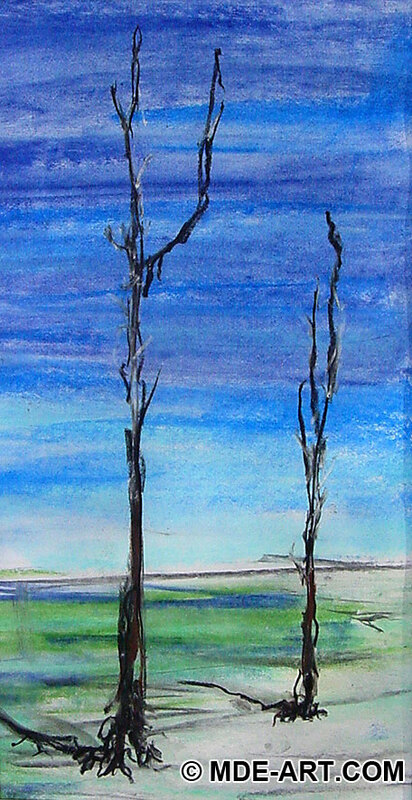 This is a charcoal and pastel drawing of two trees created in 1998. A rich blue background was first applied to the paper with broad strokes, using the long edge of the pastel stick. Hints of green and blue were also applied to ground, with the white of the paper used to indicate the sandy landscape. 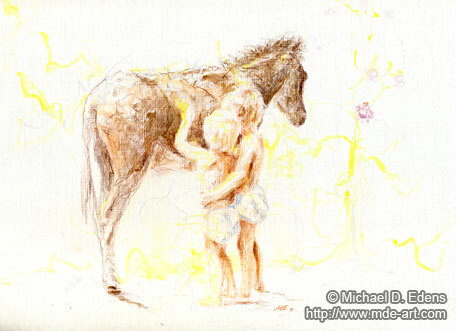 This helps to invoke a desolate and cold feeling in the drawing. Black charcoal and white chalk was then used to loosely draw in the trees, using thin heavy lines. The short shadows indicate a high sun, and the barren trees add to the desperation of life trying to grow in a harsh environment. 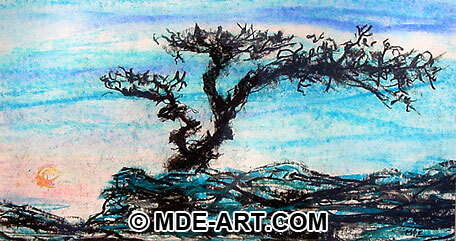 This charcoal drawing of a bonsai tree with the sun in the background was sketched in 1998. A tension is created between the contrast of soft pastels used for the background sky, sun, and atmosphere, and the crisp dark silhouette of the bonsai tree and rocky landscape. The soft orange and pink sun was drawn first, and then surrounded by the blue sky. The cliffs and rocks were drawn next with charcoal, with the bonsai tree itself loosely sketched after that. 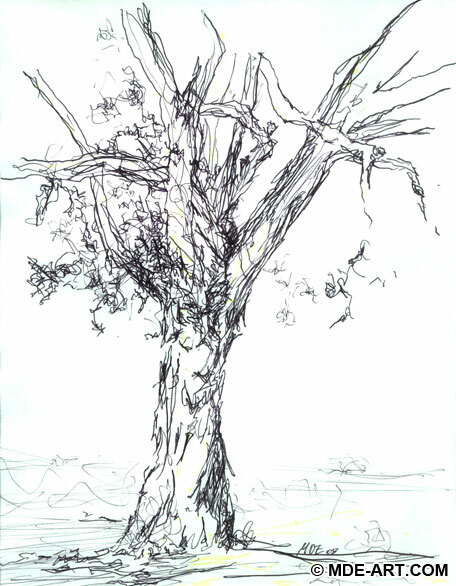 Blue highlights were added to the rock face, and more energetic lines were utilized to sketch the twigs and branches of the tree. These 2 landscape artworks are painted with a mix of acrylic paint, charcoal and pastels, and some latex paint. 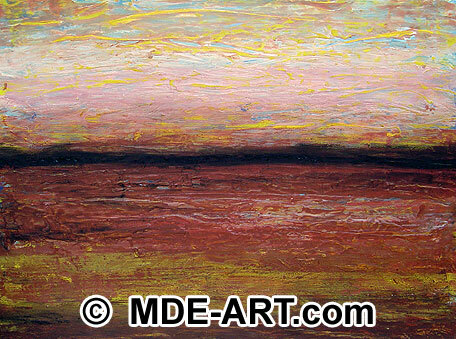 The first piece of art emphasizes a strong, deep horizon line to pull the viewer into the landscape. 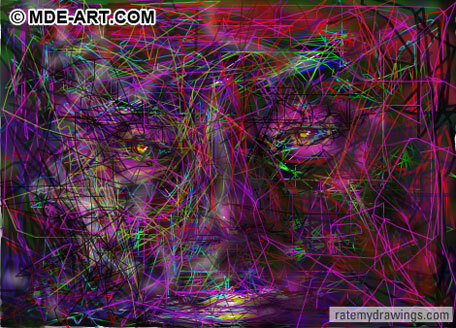 Once there, the eyes are able to slowly find their way around the multiple layers of color and value. Subtle changes in value in the real painting were unable to be replicated in the photograph below. 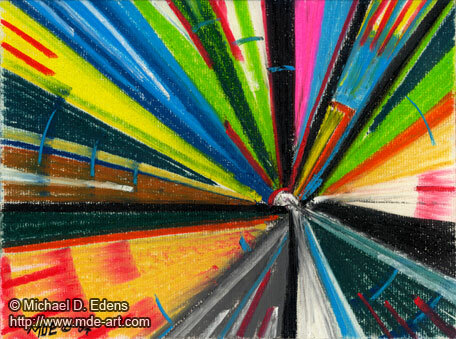 The second landscape painting has energetic strokes of color, all swirling around to form the semblance of a landscape. 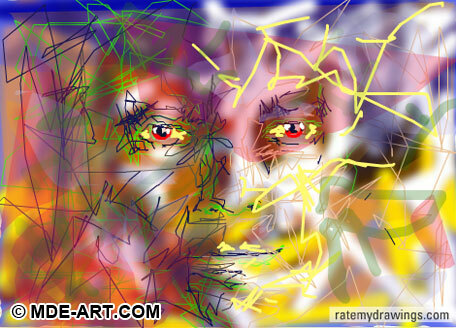 The art is abstract, with more weight given to the bottom of the art, rather than the horizon. A side to side motion in the paint, and sprinkles of white chalk, add a unique feeling of tumultuousness to the entire work of art.